1. 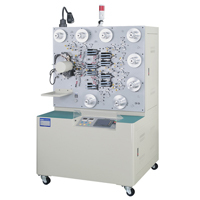 This automatic winding machine is designed for metallized film capacitor. It can burn off both faces of metallized film and wind 2 capacitors at the same time. 2. The machine adopts PLC programmable design with monochrome screen to drive the motors of main winding control system and device movement for stable and fast transmission. 3. Mechanisms are driven by Cam and it is easy to adjust outer sealing, burn off, and pressure roller devices to stabilize the productivity. 4.Max. element dia. is 28mm; single-element winding range 16~61mm width; double-element winding range 6~31mm width Mandrel range 2 – 6 mm. Mandrel range 2 – 6 mm.